Montagne Jeunesse are a brand I have long enjoyed and their face masks, in single use sachets, are instantly recognisable in pharmacies and supermarkets. I remember using their products back when I was in school and I always thought it to be such a treat when I was allowed to choose one as we were doing our weekly shop. While I always thought that their face masks were great, their name Montagne Jeunesse, not so much. It means ‘mountain youth’ in French but the trouble is that so many people had difficulty pronouncing it, including myself. However fans of Montange Jeunesse may worry not as the company have rebranded and become 7th Heaven! The face mask that I have been using most recently is the Strawberry Souffle Moisturising and Purifying Masque* which is packed full of natural goodness including Aloe Vera and Vanilla which help to calm and soothe the skin. As soon as you open the packet, you can smell the delicious strawberry scent. It reminds me of having strawberry fromage frais as a child and it smells utterly delicious. The mask is thick, creamy and rich in texture, light pink in colour and it has very small particles in it that almost look like very small strawberry seeds. It feels and smells very natural, as though you’ve just whipped up some strawberries and cream. There isn’t anything synthetic feeling about this mask which shows how good quality it is, especially for the low price point. I applied this mask to clean skin, then lay back in the bath for a good 15 minutes before removing it with warm water and a face cloth. The mask sets slightly but it doesn’t completely harden so if you’re someone with very dry skin then this formula will be particularly effective for you. It is suitable for all skin types, including my super oily skin, which I was surprised about as it does have a very rich, moisturising formula. 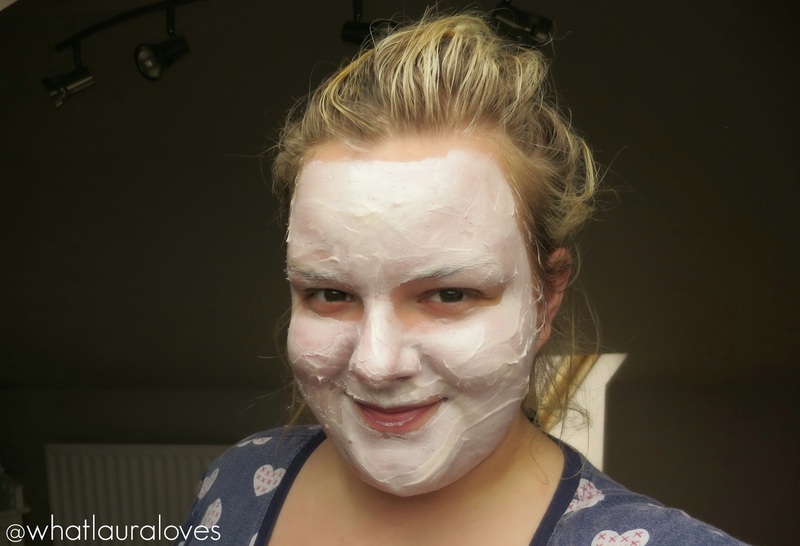 The mask feels so comfortable to wear and when removed, my skin looked smooth and hydrated. The little particles in it helped to gently exfoliate my skin as I was removing it as I used my hands in a scrubbing circular motion. After removing the mask, my skin looked and felt so soft and hydrated. It didn’t feel tight or uncomfortable at all and I’m really happy with how moisturised my skin continued to feel after the use of this face mask. I love that they’re available in single use sachets as its hygienic, controls the amount of product that I use and ensures that the product doesn’t go off or dry out in between uses. Its also very travel friendly and I’ll definitely be picking some more of these up before my holiday to Morocco as they’ll be ideal for putting some moisture back in to my sun drenched skin! 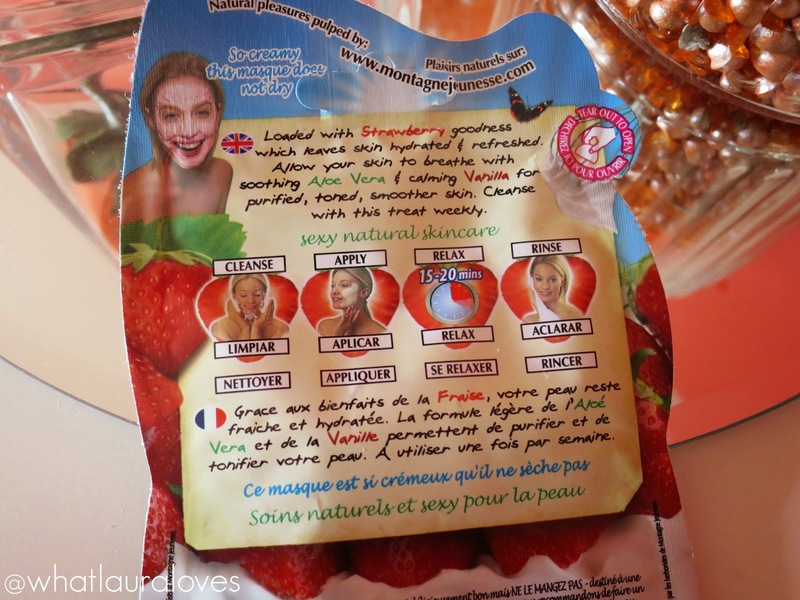 The 7th Heaven Strawberry Souffle Moisturising and Purifying Masque retails for £1 from the 7th Heaven website where you can get FREE DELIVERY when you spend over £15. This mask is also available from New Look, Amazon and from some Superdrug, Boots and supermarket stores. 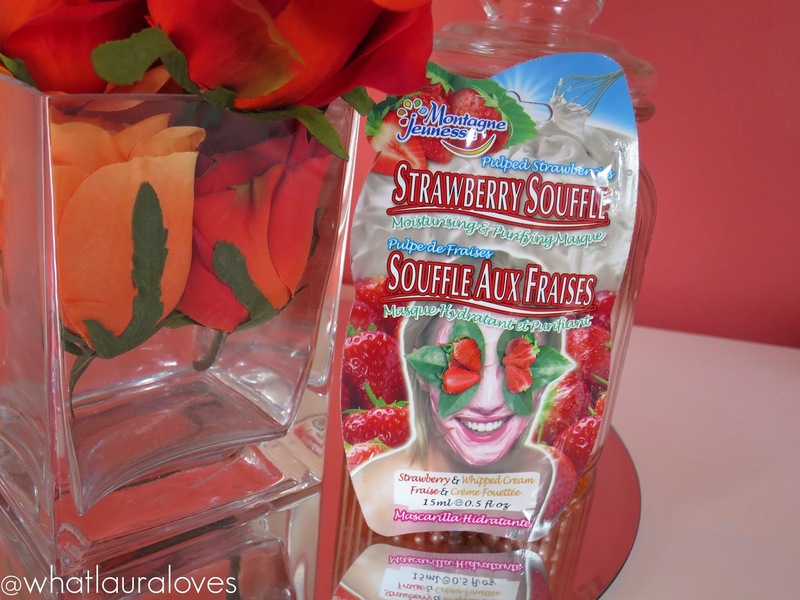 What are your favourite Montagne Jeunesse/7th Heaven face masks? I look at them every time I'm in line at the cashier in Ulta, but I've never purchased any. It sounds heavenly! awww you look so cute with that mask on! !